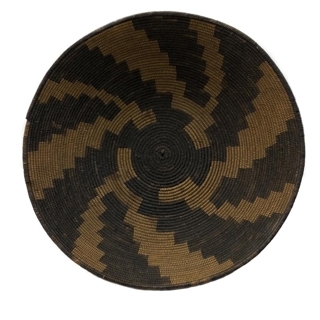 Apache Indian baskets are primarily divided into four main forms: Trays, Ollas, Bowls & Burden Baskets. Apache Trays range from flat, curved, to bowl shaped. Apache trays with pictorial elements (dogs, horses, and or people) are the most valuable and if done in a third color, red -generally from yucca root, can be extremely valuable. Almost all old apache baskets main coloration will be yellow, willow shoots, originally white, over time become oxidized by the sun turning the willow stitches yellow. Apache trays were originally made for winnowing grain or for food usage. Apache Ollas: The Olla shape was conducive to storing grain which was its original purpose. Apache Ollas are the most valuable of all Apache baskets. The higher end pieces have great symmetry, size, are polychrome and display multi-figures. As with all art, condition is an issue and pieces in mint condition demand a premium Apache bowls: The Apache bowl, comes in many forms. Bowls can be oval, have large jar shapes, look more olla in design but without the neck, or can appear more tray like without the flatness of a tray. Because of their variety, the value is quite variable. Price is determined often on the aesthetics, stitch count, condition, and art quality of the basket. Apache Burden Baskets were the last form to be made more for tourists than for self use. Burden baskets were made as utilitarian baskets decorated with tin cones, yellow or green ocher, most have a conical shape. Those with original raw hide, cones, and original straps are most valuable. Burden baskets were made for carrying wood , food and generally are in less than excellent condition. Yavapai Figurative Olla, c. 1900, 21.25" x 20"
Havasupai Basket, c. 1890-1900, 7.5" x 10.5"
Apache Tus, c. 1890, 13.5" x 9.2.5" x 9.5"
Apache Tray, c. 1890, 4.25" x 16"
Apache Tray with Rattlesnake Designs, c. 1890, 8" x 7" x 5"
Apache Tray with Mountain Design, c. 1900, 2" x 7.75"
Apache Pictorial Olla c. 1900-20s, 9.75" x 8.25"
Apache Olla, c. 1900s, 12" x 9"
Apache Olla with Checker Design c. 1890s, 10.5" x 12"
Apache Burden Basket with Figurative Pictorials by Liona Antone, c. 1980, 7.5" x 11.75"
Apache Burden Basket c. 1890s, 12" x 14.5"